Posted on Sunday, March 2nd, 2014 at 12:00 pm. The 2014 TACL Political Internship Program is now accepting applications! This 8-week summer internship program for college students, held June 7 to August 2, will have positions available in Los Angeles and Washington, D.C. 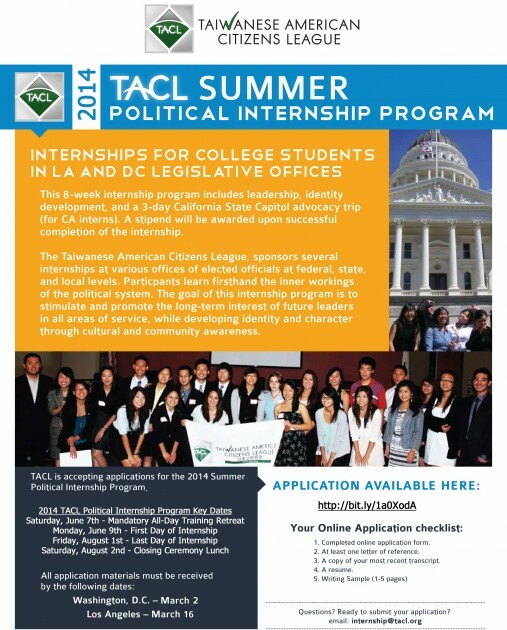 The Taiwanese American Citizens League (TACL) Summer Internship Program, established in 1992, was formed to infuse the Taiwanese American community with a greater understanding of the political system through placement of college level students in offices of local, state, and national public officials. This allows Taiwanese Americans to be better recognized as a developed community with a voice. TACL’s primary mission is to promote Taiwanese culture, heritage and identity as well as involvement in American society. Interns experience first hand how the political system works and observe and participate in the formation of policies, both domestic and foreign. Political interns will be assigned to offices located in Washington, D.C. and Los Angeles. In addition to working in their offices, interns visit top legislators in an intense lobbying trip, attend community events, participate in leadership development workshops, and various other activities. TACL interns gain invaluable skills and access to a network of TACL alumni through our mentorship program. Alumni of the TACL Political Internship Program have gone on to become elected officials, Congressional Staffers, State and Local level government staffers, local business leaders and students in top graduate school programs. Interns need not be of Taiwanese heritage, however a vested interest in Taiwanese American issues must be demonstrated.